Tag line: "The black shadows of the past bred this half-man . . . half-demon ! . . . creating a new and terrible juggernaut of destruction !" 1939's Son of Frankenstein opens with the image of Castle Frankenstein, dark and desolate, sitting high atop a hill. The camera closes in to reveal a lone silhouette in the window, that of Ygor (Bela Lugosi), a former criminal who's been living in the abandoned castle for years. A cart, pulled by several peasants, rushes by, hoping to get past this accursed place as quickly as possible, but a couple of young boys remain behind, eager to throw a rock through one of the old castle’s windows. The two freeze in their tracks, however, when they spot Ygor looking down at them, and immediately run off. I can’t say as I blame them; if there’s one thing that would cause me to make a hasty retreat, it’s Bela Lugosi staring back at me! 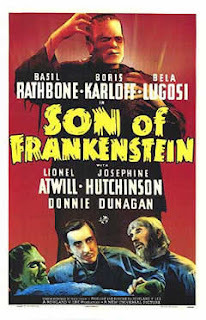 Having inherited his late father's estate, Baron Wolf Von Frankenstein (Basil Rathbone) travels to Europe from America, where, along with his wife, Elsa (Josephine Hutchinson), and son, Peter (Donnie Dunagan), he takes up residence in the long-dormant Castle Frankenstein. Unfortunately, the locals, remembering all too well the horrors that the last Baron unleashed upon their village, don't exactly welcome him with open arms. Inspector Krogh (Lionel Atwill), the town constable who himself had a tragic run-in with the Monster (Boris Karloff) years earlier, promises Frankenstein he and his family will be protected, and Frankenstein, in turn, assures the Inspector he has no plans to carry on with his father's work. But when Ygor leads him to the crypt where the monster's body lies, the young Baron decides its time to clear his father's name, and attempts to revive the creature so that it can be studied. Ygor, however, has other plans. Like Bride of Frankenstein before it, which introduced us to two of the series’ most iconic characters in Dr. Pretorius and the Bride, Son of Frankenstein has its own pair to add to the mix. Lionel Atwill’s Inspector Krogh had a childhood encounter with the monster that cost him his right arm. Now forced to go through life with a prosthetic limb, Krogh hopes to ensure such a tragedy will never be repeated. During Krogh's first visits to Castle Frankenstein, the newly-arrived Baron argues that the stories surrounding the Monster have surely been exaggerated, and asks the Inspector, who he just met, “Do you honestly know of one criminal act this poor creature committed?”. Krogh pushes up his artificial limb, wipes off his monocle, and recalls how his experience with the Monster changed his life forever. “One doesn’t easily forget, Herr Baron, an arm torn out by the roots”. Unlike many of the villagers, who live in fear of the creature, Krogh remains a bitter man, and will stand and fight should the occasion arise. And then there's Ygor, played to perfection by Bela Lugosi. Walking around with a broken neck (condemned to death, he somehow survived his hanging, and the protruding bone jutting up from his neck is a gruesome reminder of it), Ygor is every bit the oddity the Monster is, which might explain why he has such a fondness for the creature. Though subservient to Frankenstein, Ygor exists solely to help the Monster. “He is my friend”, he tells the Baron, and even refers to the creature as Frankenstein’s brother (“but his mother was lightning”). Not to be upstaged in his own series, Karloff has a few strong moments of his own (though somewhere between the events of Bride of Frankenstein and this film, he once again lost his power to speak). A late scene, where the Monster discovers a wounded Ygor lying on the ground, is both powerful and chilling. Son of Frankenstein marked the final appearance of Boris Karloff as the Monster, and he certainly went out with a bang. Like Bride, Son managed to put a new spin on an old story, and in so doing kept the series not only interesting, but fresh and alive. I just watched this last Halloween after not seeing since junior high school and was surprised at how much I enjoyed it. A very solid entry in the Universal horror series. It's on Netflix streaming. Robert: Thanks for the comment. I bet this made a perfect Halloween film! It's a great entry in what to that point had already been a great series.